Quick little update on the final stage of the "Volta" Ciclista a Catalunya, A.E. Stage 7 definitely saw me emptying the tank. There were lots of crashes, attacks and exploding legs, including my own!Happy to be on the other end of it! I particularly dig the picture below because it has my ole buddy and teammate Amael Moinard hanging it out there with me. Stage 6 of the "Volta" Ciclista a Catalunya, A.E. was an interesting one. We woke up to falling snow with already a few accumulated inches. With the profile immediately going up a seven-kilometer climb where temps were well below freezing and even more snow on the roads, race organizers, teams and rider reps made the tough but safe call to transfer the start farther down the road. This translated to a long morning with a couple hours in the bus and more waiting around, but that didn’t slow down the racing. These short starts are notorious for creating surprises and there were plenty of attacks from km 0. When two riders grabbed a bit of a gap, I think most of us thought they would be easily managed by teams with a sprint interest. A climb midway through split the bunch and then some crosswind split it again. We stayed up and in good position and were on the good end of all the splits. Most of us thought the two riders would be pulled back just in time, but once again it proved how exciting shorter stages can be. They stayed away for the win. It’s always a shame when a break stays away and BMC Racing Team doesn't have someone in there, but with only two riders staying away, obviously, there are a lot of teams feeling this way! I was happy to stay relatively warm, thanks to a huge pile of great gear. My laundry bag was very full tonight-- winter shorts, knee warmers, shoe covers, base layer, arm warmers, jersey, vest, liberty jacket, Sturm Prinz rain jacket, cycling cap and neoprene gloves! At 212 km, Stage 5 was the longest stage of this year's "Volta" Ciclista a Catalunya, A.E. and it was another mountainous day with three big climbs. 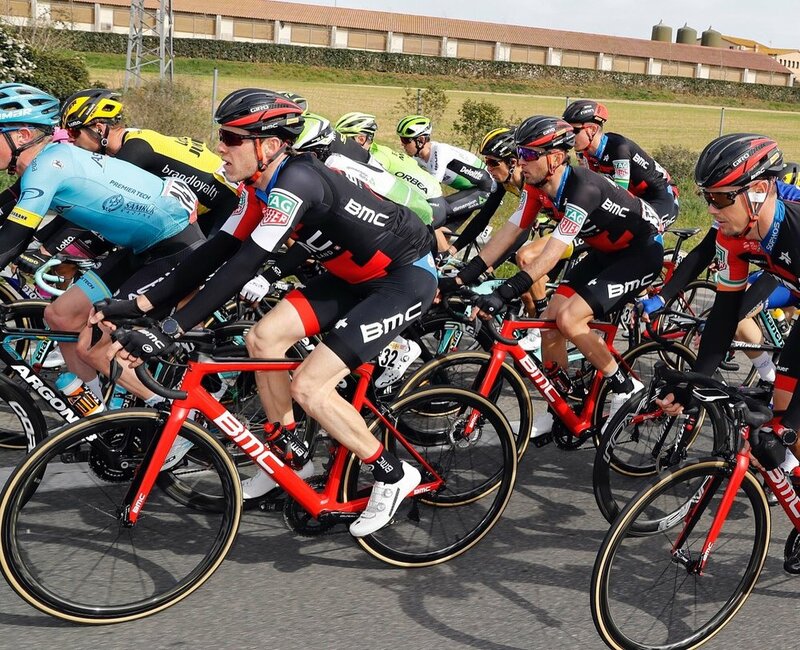 All of BMC Racing Team was given the green light to try for the break after time gaps opened up following Stage 4. I could definitely feel some fatigue from yesterday’s big effort, and although I made a few attempts in the fast downhill start, I was happy to see my teammate Danilo get some daylight between him and the peloton in a strong group to keep him company. Movistar once again exerted their cyborg-like control and kept the gap around 3 to 4 minutes, but they seemed ok with letting the break stay away if no other team wanted to close it down. There were a few strong teams who had missed the break, but I think many were discouraged knowing that if they closed the gap, Valverde would probably again take the win on the technical downhill finish with the final climb most likely thinning things out. There were some attacks over the final climb, which lifted the speed dramatically, and after a bonkers downhill (which included a five-kilometer tunnel where we averaged about 80 km/hour for 5 minutes), we caught Danilo’s group on the line as he sprinted to a solid fifth place. I did my best to stay up front and find the balance between keeping myself in good position to sprint if it came back together but not taking anything too crazy through those final corners. I'm happy to be done with this long stage; another long one at almost 200 km tomorrow and it looks like it’s going to be a wet and cold one. Catalunya always proves to be a relentless week as there is no TT or shorter day to catch your breath. My two other races this season have included TTs and ended after five days, so hoping my body responds well. I am looking forward to bagging the added depth that comes from two more hard stages. Stage 4 of the "Volta" Ciclista a Catalunya, A.E. was full-on racing into the big Pyrenees Mountains, which are still snowcovered. Fortunately, the sun was out, and the roads were mostly dry. Tejay and I did a recon of this stage last week, and it was helpful to know all the ups and downs ahead of time. Any stage when the breakaway hasn't gone after the first hour usually becomes an interminable fight. Everyone starts to get the feeling that the next attack could be the one that goes to the line. I burnt some matches in the second hour making sure we were present in some dangerous splits and bigger groups before my BMC Racing Team teammate Joey finally slipped away with a few others and the home team Movistar calmed things down with their typical stunner stiff tempo. Climbing the Col de Crueta for over 20 kilometers and into the snowfields was a big effort to stay with the lead group. It’s always mind-blowing how fast and long we can climb and how many guys are still there fighting. It really becomes a battle of wills for most of us while the top contenders comfortably tap away up the climb in relative comfort. Joey did a big effort to get back to the front group over the top, so we had a full BMC American contingent going into the frantic downhill heading into the final climb. Valverde was up to his usual tricks and got away on the downhill, so Joey and I helped chase to keep Tejay in the game. We put Tejay in the best position possible going into the final climb and then it was lights out and game over for me after a ballistic first couple kilometers heading up to La Molina. Tomorrow, we continue the high mountain stages into more unchartered territory. We head into the far northwest corner of Catalunya over a demanding 212 km. The morning will come too fast with an early 10 am start after having a comfy 1 pm roll out over the past few days. The third stage of the "Volta" Ciclista a Catalunya, A.E. was a cold one, even with the altered route that kept us off the 2000-meter peaks and away from the alleged avalanche zones. It didn’t do much to tone down this pack of top-notch climbers who were obviously itching to get into some harder climbs. I got to take on some of those familiar roads around Girona again, but I can definitely say it was the fastest I’ve ever descended off the Col de Bracons! I didn’t feel as strong as I’d hoped over the final climb but managed to rejoin the front group a few kilometers before the finish. Then a big crash tossed some chaos into the final moments. Tomorrow’s stage will be a couple notches up from today’s regarding climbing and difficulty. Condition-wise, it will be another frigid one as we climb up to almost 2000 meters followed by a long downhill, which will likely include some icy, watery snow melt before a classic Catalunya finish at La Molina where the ski slopes are open and people will be looking at us wondering what in the world we are doing up there. I have to admit, 11th place is tough. Being that close to top 10 but just outside of it. I keep telling myself that it could be worse....it could be 12th. We kicked off Stage 2 of the "Volta" Ciclista a Catalunya, A.E. with some strong headwinds. Combine that with the fact we all know there are some extremely difficult mountain stages around the corner, and we kept a pretty slow pace for the first few hours. Things ramped up and got a bit dicey when we hit the crosswinds in the second half of the stage, but the always bending and undulating roads were never the right combo to cause splits, especially considering the teams here are stacked with climbers. The final five-kilometer climb, which peaked 10 km before the finish, was a big effort on a wide sweeping road and I was once again reminded of the depth of the field at World Tour races. I was punching tickets of riders getting dropped for the final couple kilometers of the climb and digging deep to make it over with the front group. We planned to help my BMC teammate Danilo Wyss in the sprint, but after seeing he wasn’t there, I thought I could give it a try. A technical final few km had me regretting not studying the roadbook more closely this morning but in my defense, the racebook maps look like they were drawn by a kindergartner, so it ends up being basically virtual recon. I did my best to position myself and sprint and finished just outside the top 10 in 11th position. The next three days will be a massive load, especially with the frigid temps up in the Pyrenees. There’s talk of about rerouting some stages, but we haven’t heard any official word yet. 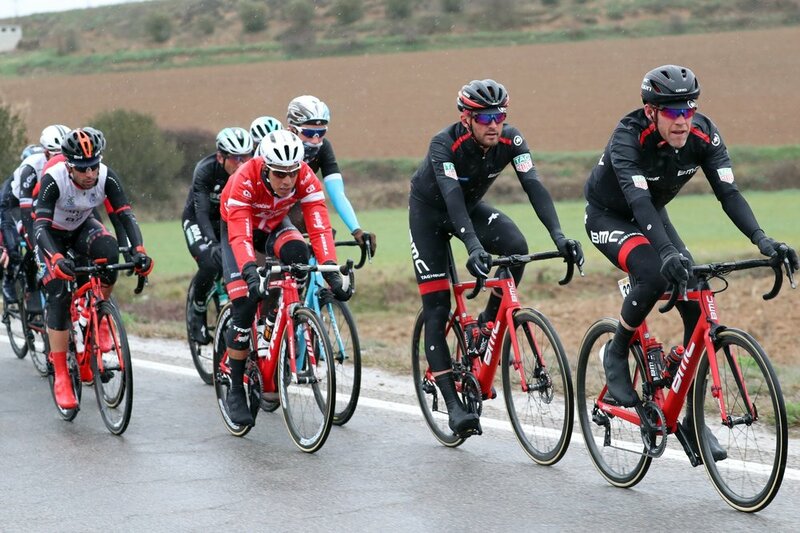 Now that Spain’s favorite rider is leading the race, I’d say there is a better chance they'll decide to keep us slightly warmer and hopefully safer, but knowing Tejay is climbing great, I’m not sure how I feel about that. The opening stage of the "Volta" Ciclista a Catalunya, A.E. was definitely enjoyable because it was a rare opportunity to race on some familiar roads around my European home in Girona. The spectacular coast sections are some of my favorites, and while we didn’t really have a chance to soak up the views, it's always nice to know where you are and what’s coming next. Physically, the race rhythm took a bit of an adjustment after spending the past three weeks training. Fortunately, the profile and tactics were in line with this transition. But it only gets hillier, harder, and probably a lot colder from here, so I appreciate today as a good way to start.